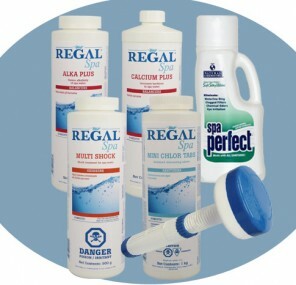 We have put together these hot tub water care products and are offering them to you at a discounted price. Just $110 for everything you need! This kit includes the basic hot tub chemicals you require to run a bromine spa. Alka Plus (1kg), Calcium Plus(900 ml), Mulit- Shock (900 g), Bromine Granules (900 g), Bromine Tabs (700 g), Floating Dispenser, and Spa Perfect Enzymes (1 L). Alkalinity and calcium are the pillars of water balance - when these levels are right, fine tuning pH will be easy or unnecessary. When you start with fresh water, shock your water and then float Chlorine Tabs in the dispenser to maintain your sanitizer residual. Multi-Shock deals with unwanted waste and contaminants and keeps your water clear and fresh. Add at least once a week or after every soak. Spa Perfect enzymes are an extra cleanse for you spa water. Added weekly enzymes break down organic waste (sweat, etc) and prevent filter loading. BluPool's team offers an excellent service and really understands the benefit of using the best technologies in the market to maintain a swimming pool in perfect conditions.